With the first substantial rain in weeks pounding on the barn’s tin roof and water pooling under the doors like a spring creek rising, Dale Bartholomew of Growmark FS announced August 8 at Empire Farm Days in Seneca Falls, NY the official launch of 4R NY Nutrient Stewardship Certification, a voluntary certification effort for the state’s agribusiness industry aimed at improving the water quality of New York’s waterways. “The 4Rs refers to the use of the right fertilizer source at the right rate, the right time and in the right place. It’s not about having the newest technology, though technology could play a part. It’s a philosophy based on doing what’s right for the crop, the soils, the farm and ultimately our waters,” explains Bartholomew. The roots for the 4R program lay in the Western Lake Erie Basin of Ohio, a source of drinking water for millions and home to more than half of all the fish in the Great Lakes. To help solve the problem of excess nutrients in waters, the 4R Nutrient Stewardship Certification Program was created in 2014 by the agricultural industry, state agri-business associations, The Nature Conservancy, The Ohio State University, Michigan State University, state farm bureaus, state agencies and others. In New York, The New York State Agribusiness Association (NYSABA) was paying close attention. “Jeanette Marvin, administrator of NYSABA, came to me a year ago and said, ‘We’ve been watching a nutrient stewardship movement in Ohio. Would you be willing to head a committee to bring that to New York?’” recalls Bartholomew, now Chair of the 4R NY Nutrient Stewardship Council. That committee turned into an Advisory Committee of 92 individuals. From the Advisory Council, eleven were chosen to create a board of directors for the proposed program– the 4R NY Nutrient Stewardship Council (NSC), a diverse set of stakeholders from agribusiness, government, university and non-governmental sectors with a common goal of maintaining agricultural productivity while also improving the quality of New York’s lakes, rivers and watersheds. Initial funding for the 4R NY program was provided in partnership by NYSABA, The Nature Conservancy, and The Fertilizer Institute with participation from Cornell University, NYS Dept. 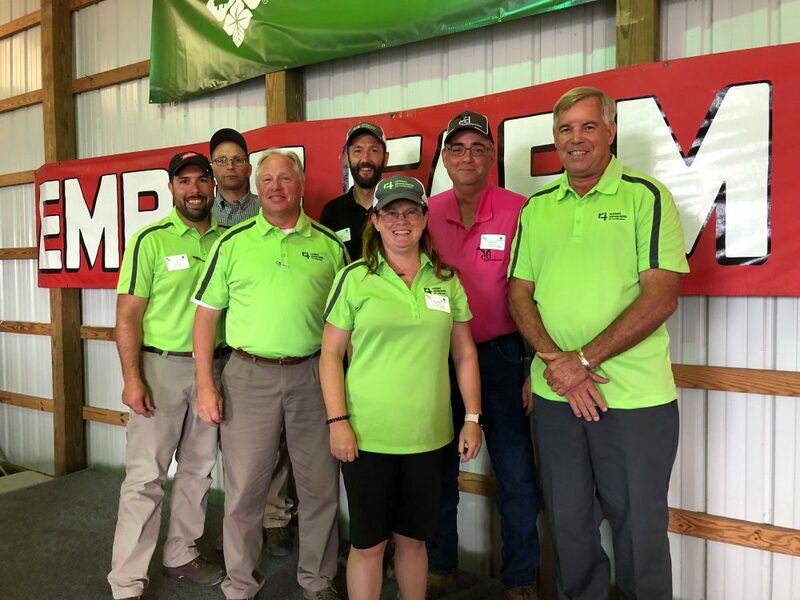 of Ag and Markets, Natural Resources Conservation Service, NY Farm Bureau, Northeast Region Certified Crop Advisers, and Ohio 4R Nutrient Stewardship Certification. Assistance in writing the standards and creating the program structure has come from farmers, agribusinesses, and crop advisers from across New York State. New York State has more than 7,600 waterbodies, two Great Lakes and over 70,000 miles of rivers and streams. Most algae are harmless and are an important part of the food web. Certain types of algae can grow quickly and form blooms, which can over all or portions of a water body. Even large blooms are not necessarily harmful. However, some species of algae can product toxins that can be harmful to people and animals Blooms of algal species that can produce toxins are referred to as harmful algal blooms (HABs), HABs usually occur in nutrient-rich waters, particularly during hot, calm weather. Despite the many actions farmers have taken to improve soil health and reduce fertilizer runoff, nutrients leaving fields and entering streams and lakes continue to contribute to water quality problems. Farmers are increasingly challenged to balance rising input costs, demand for higher yields, and the ever-present responsibility to be good stewards of lands and waterways. Farmers are reliant on the advice and guidance of nutrient service providers and crop advisors to help provide innovative best management practices that will help maximize profits while reducing nutrient loss. The voluntary 4R NY program begins with participants accepting and following a set of science-based standards which take into consideration state, and federal regulations, while relying heavily on Cornell recommendations. The standards accept commercial or organic sources. The program which includes training and education, monitoring and field implementation of 4R practices, culminates with independent, third-party audits and demonstrates the industry’s commitment to nutrient stewardship. The program is open to nutrient service providers, dealers and crop advisers. Those eligible for the program can learn specifics, hear about the program’s progress and sign up for New York certification at the Northeast Agribusiness and Certified Crop Adviser Conference the afternoon of November 29 at the DoubleTree Hotel, East Syracuse, NY. For more information visit www.nysaba.com. For more information about the program or to register for the conference, visit nysaba.com, email nysaba@rochester.rr.com or call 315-986-9320. The 4R Nutrient Stewardship Certification Program is governed and guided by the 4R NY Nutrient Stewardship Council, a diverse set of stakeholders from business, government, university and non-governmental sectors with a common goal of maintaining agricultural productivity while also improving the quality of New York State and its contributing watersheds. The program is administered by the New York State Agri-Business Association.